FACTORY I made is a collaborative creative community, design incubator and retail platform. We support creative commerce by expanding avenues to bring good ideas to market, and by providing networking and education opportunities for art and design. What do you want to make? The FACTORY creative labs offer workspace, tools, materials and instruction for design projects, prototyping and production, and digital resources for video, music and graphic production. Classes have launched, for all levels. You name it, we’ll help you learn how to make it: screen-printing sessions, sewing, and fiber arts, DIY light fixture workshop, crowd-sourcing seminars, tutorials on how best to launch a kick-starter campaign — share ideas, skills and experience, develop projects and concept to creation, branding to business plan. 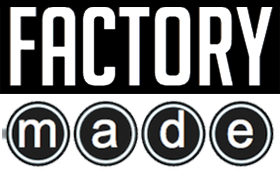 made is an indie-modern market and showroom within the FACTORY that carries innovative goods, furnishings, fashion and accessories by artists, designers and select American manufacturers. made also carries overstock, recycled and reusable goods and materials to help extend the lifecycles of existing manufacturing streams and to buy, sell or trade for new creative projects. everything at made has a story worth telling. We are passionate about where things come from, what they are made of, how they are made, and who makes them. We seek out thoughtful products created with integrity and imagination, and enjoy sharing stories of all our makers and manufacturers in our makers’ gallery and public forum. FACTORY I made is led by a multidisciplinary team experienced in design, fabrication, merchandising, and mentoring. Founded in 2011 in collaboration with AIM House, a young-mentoring program, FACTORY I made is committed to providing a creative path for makers of all ages to learn, to build experience and to make something happen. We also help connect makers with larger material resources and manufacturers. As a part of a growing community of local, social and creative entrepreneurs, we value responsible commerce, innovation, and integrity; we encourage meaningful relationships, we care deeply, and we believe we are all capable of making the world a better place. We think good art and design can be accessible to all, and everyone can have the opportunity to turn a good idea into a good business.